For some reason I just couldn't get a card done the last few days. Probably from a lack of sleep. Well, today I pulled myself together and I actually finished it!! For this saturdays's sketch we were supposed to choose one of Sketch Saturday's sketches from the past. I chose this one because it is sort of simple, and that is the way I prefer my cards to look. I received this cute Penny Black image from someone of SCS thru pay if forward images. I'm sorry I don't remember who I got it from, but thank you so much!! Image was colored with my alcohol markers (Blick studio, prismas and copics) and cut out with my cutterbee scissors. The two scallop layers are nestabilities that I cut out using my big kick. The bunny was adhered with dimensionals. The designer paper is from Stampin Up. I added stickles glitter to about every other dot on the paper. Stickles were also added to the tulips, daffodils and brad. Did some paper piercing around the punched out circle and the green nesties layer. Stamps: Penny Black Bunny Joy(? not sure of name), cute converse (SU), Paper: White (Georgia Pacific 110lb), certainly celery, Designer Paper (SU), Ink: black, Accessories: nestabilites scallop squares, 1 1/4 circle punch (EK), small oval punch (SU), paper piercing tool (SU), celery grosgrain ribbon (SU), paper flowers and brad. Beautiful! I just love the way you pulled this together. And I do love Stickles. Fabulous card Ellie, Love the image and the papers are gorgeous. Cute Bunny! and i love the sparkles! Oh so cute. A break from Christmas is just what we all need. 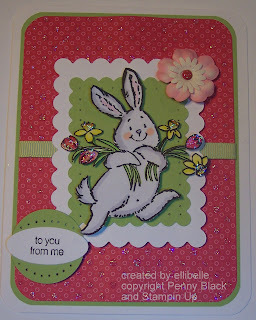 Ellie, congratualtions on the Whimsy DT call...can't wait to see whar you create....so happy for you! bright and cheerful design, just perfect.